US, 1989, 117 minutes, Colour. Richard Dreyfuss, Holly Hunter, Brad Johnson, Audrey Hepburn, Roberts Blossom, John Goodman. 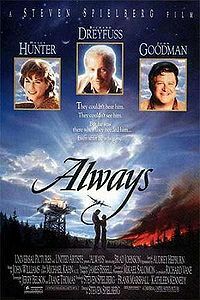 Always is Steven Spielberg's remake of the M.G.M. 1943 romantic movie, A Guy Named Joe. The parts played by Spencer Tracy, Irene Dunne, Van Johnson are now taken by Richard Dreyfuss, Holly Hunter, Brad Johnson. John Goodman (from Roseanne) is Dreyfuss's buddy. This is the kind of film that will appeal to some, will make others feel that it Is too sentimental. However, it is something of a change of pace from Spielberg's action adventures and children's films and shows him to be a very strong American romantic. 1. Pleasing romance? Ghost story? Steven Spielberg movie? 2. A remake of A Guy Named Joe? Fidelity to the original, characters and plot, styles and treatment? Americanisation? The '80s and fire-fighting compared with World War Two? 3. The Montana locations, the scenes of the forest fires? Life at the station? The fantasy for ghosts? The flying sequences? 'Smoke Gets In Your Eyes,' the songs and the score? 4. The title, love, forever, letting go? 5. The world of the fliers: the opening with the plane coming over the fishing boat, the raging fires, Pete without fuel and the danger, his getting down, heroics, the fighting of the fires and putting them out, Al and the engine aflame, Pete and his saving, him, the explosion? Dorinda and her flying? Making the path for the trapped men? The flying scenes and the visuals? The memories of the dogfights and war movies? 6. Richard Dreyfuss as Pete: genial, good at his job, his heroics, his having fallen in love with Dorinda, her birthday celebration, out of fuel, his reactions, panic, control, getting the plane down? Verbal sparring with Dorinda? The gift of the girl clothes and his attraction towards her? Arranging the song? The dance, the men washing their hands, his holding the towels? His seeing Ted? The night with Dorinda, tier dreams, talking with her, not saying 'I love you,' the proposal to go into training, AI's suggestion? The bonds between the three? Going on the job, saving Al, his own plane exploding? 7. His death, wandering the burnt forest, the encounter with Hap? His quest, the passing of time, training Ted, being an inspiration? Hap's warning about being self-centred? Seeing Al, influencing his thoughts, the oil jokes? His helping Ted, advice? Ted and the old man and the wrong words coming out to influence his going back to Dorinda? Seeing Dorinda, watching Ted and Dorinda have the meal, falling in love, listening to her tell stories about him? The pain? The song, the dance with Dorinda? Going back to Hap, talkIng things over, his suffering? His return, in the plane with Dorinda,the danger, the crash and helping her to survive? His beIng able to leave her and free her? 8. Themes of death, love, letting go and giving? 9. Dorinda as tough, her anger with Pete, her own flying? Verbal sparring? The gift of the dress and the shoes? Their song? Dancing with everyone, seeing Ted? The night with Pete, her dreams and shopping? The bargain, her anger, love, anguish? her friendship with Al? The grief at Pete's death? In San Diego and her work, Al persuading her to return? Her house, the machine on the front lawn? Meeting Ted, attracted, enjoying his company? Buying the meal and making as if she had cooked it? Talking about Pete? The dance with him invisible? The mission, her tricking the pilot, her tough stances, the success of the exploit, the crash, whether to die or not? Freed by Pete? 10. Al and his size, buddy, work, the dangers, the suggestion of Pete going to do training, his possibility of dying, Pete's death? The months passing, in charge in Colorado? Ted and the all? The tests and his being covered? Getting rid of Ted? Going to San Diego, meeting Dorinda, persuading her to return? Taking Ted in again? The final mission? 11. Ted as a nice young man, awkward, the dance, his return, Pete helping him, his failure, getting the sack, the encounter with the old man, the return, meeting Dorinda, the meal, gentlemanliness, the plan for putting out the fire, reunited with Dorinda? 12. The fire-fighters, camaraderie, their ethos? The dangers of their work? Trapped in fires? Escape? Rachel as the woman on the station, attracted towards Ted, his telling her about falling in love, her machine, her disappointment? 13. Audrey Hepburn as Hap, the guardian angel, her advice, guidance, sending the good people back, helping them to inspire others, the warning against self preoccupation? 14. The old man and his being able to communicate with Pete? Changing Pete's words to influence Ted? 15. Themes of love and death? Sentiment and feeling?